Guy Gavriel Kay is a lawyer who helped edit some of J.R.R. Tolkien’s works in the 1970s. Many of GGK’s novels could be classified as historical fantasy. You can read excerpts of Guy Gavriel Kay’s award-winning fantasy at his website. I’m happy to temporarily come out of FanLit retirement to spend some time with my favorite author, Guy Gavriel Kay. Kay’s newest novel, River of Stars, was released today and it’s as wonderful as I’d hoped (here’s my review). Bill and Kelly loved it, too. Trust us: you don’t want to miss River of Stars! We’re giving away a copy of River of Stars to one random commenter with a U.S.A. address. 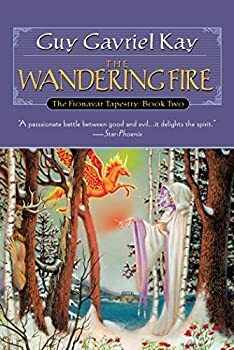 The Fionavar Tapestry — (1984-1987) The Wandering Fire won the 1987 Aurora Award. Publisher: It all began with a lecture that introduced five university students to a man who would change their lives, a wizard who could take them from Earth to the heart of the first of all worlds — Fionavar. And take them Loren Silvercloak did, for his need — the need of Fionavar and all the worlds — was great indeed. And in a marvelous land of men and dwarves, of wizards and gods — and of the Unraveller and his minions of Darkness — Kimberly, Dave, Jennifer, Kevin, and Paul discovered who they were truly meant to be. 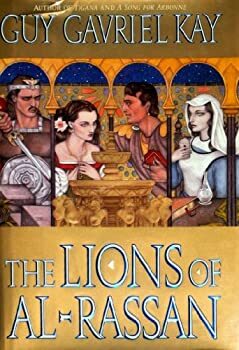 For the five were a long-awaited part of the pattern known as the Fionavar Tapestry, and only if they accepted their destiny would the armies of the Light stand any chance of surviving when the Unraveller unleashed his wrath upon the world. 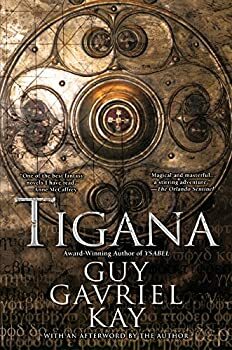 I absolutely loved everything about Guy Gavriel Kay’s stand-alone novels Tigana and A Song for Arbonne, so it was with great excitement that I downloaded the newly released audio version of The Summer Tree, the first novel in his famous The Fionavar Tapestry. 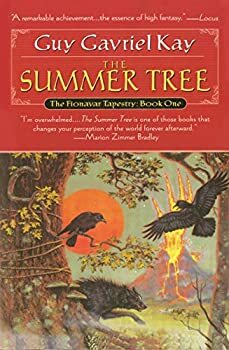 It’s been 1½ years since I read The Summer Tree, Guy Gavriel Kay’s first novel and the first in his Fionavar Tapestry. I mentioned in the review for that book that I’m an adoring fan of Kay’s later stand-alone novels but that I found The Summer Tree derivative and heavy. I would have happily skipped its sequel, The Wandering Fire, but I had already purchased it at Audible, so I thought I’d give it a chance to win me over. Simon Vance, the narrator, is one of my favorites and his bad Canadian accents were toned down this time, which made him pleasant to listen to, as usual. 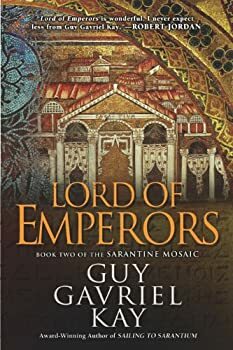 Lord of Emperors is the second (and final) novel in Guy Gavriel Kay’s THE SARANTINE MOSAIC duology. The story, set in a pseudo-Byzantine Empire, mostly centers on Crispin, a mosaicist from a neighboring kingdom who’s been commissioned to decorate the ceiling of a new chapel the emperor is building. Against his wishes, Crispin has been drawn into the Sarantine court’s political intrigue. In this second installment, the political turmoil finally comes to a head and Crispin’s life is, once again, drastically altered by events he can’t control. Not only are his and his friends’ lives in danger, but the changing political climate has major consequences for his art. 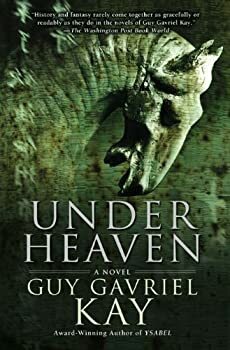 Under Heaven is the long-awaited new novel by master fantasist Guy Gavriel Kay — and let's get the most important news out of the way: it was 100% worth the wait. 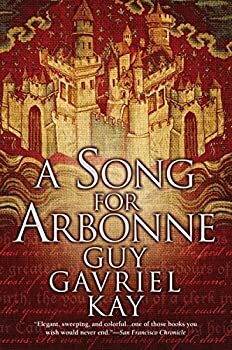 Fans of Guy Gavriel Kay know that his novels often take place in what appear to be fantasy versions of real countries: A Song for Arbonne is set in 13th century France, The Lions of Al-Rassan in Spain during the Moorish occupation, and so on. Likewise, Under Heaven once again gently blends history and fantasy, taking place in Kitai, a country strongly reminiscent of China, during the Tang dynasty. Since this is a fantasy review site, let’s get this out nice and early. 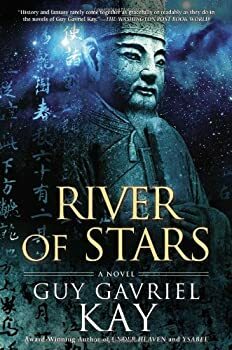 Outside of its setting — a fictionalized and truncated version of China’ s 11th century Northern Song Dynasty — there is next to no fantasy in River of Stars, Guy Gavriel Kay’s newest work. A few ghosts, an occasional fox-woman, and that’s it. So fantasy readers will have to take those few bones tossed their way and then settle for graceful, lyrical prose, beautifully drawn characters, moments that stab the heart, a masterful sense of structure and pace, and an overall elegance and skill that denotes a novelist in complete control of his creation. Oh, the things we put up with. It is difficult to summarize the plot, for so much of the story unfolds organically — indeed, as a near-perfect tainflower — that one fears to spoil the pleasure of becoming swept up in the narrative. That said, the tale concerns the Palm, a mythic penninsula reminiscent of Italy, a land divided between two wizard-conquerors. One conqueror has utterly blighted the province of Lower Corte with an undreamt-of dark magic. (Take a fresh look at the map of the Palm mid-way through, and you will grasp the immensity of the spell!) A handful of refugees must undo the spell... yet if the one wizard falls, the other will irrevocably gain control of the Palm, leaving the deadly choice: the breaking of the spell, interminable conquest... or, perhaps, perhaps, the smallest gleam of freedom. 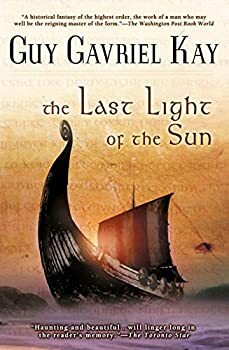 The Last Light of the Sun is another of Guy Gavriel Kay’s lovely historical fantasies. This one blends Norse, Celtic, and Anglo-Saxon histories with a bit of faerie mythos. We follow a few main characters from each of these societies as they interact with each other to shape their land and destinies. As usual in a Guy Gavriel Kay novel, we see the struggles from each perspective, so there’s no single “hero” or “villain.” We understand what motivates each of the characters and their culture and we can admire their strengths and recognize their weaknesses. In the end, we want everyone to win but, of course, that’s not what happens. In the turbulent region that used to be the stable empire of Al-Rassan, petty kings vie for power. Each of these rulers is ambitions and clever, but none of them has been able to acquire his position without the help of others — crafty advisors, brave army commanders, brilliantly inventive doctors, devoted wives and children — and sometimes the same people who have served them well are the same ones who may later cause their downfall. What can I say about this book? If I see a new Guy Gavriel Kay book on the shelf at the bookstore, I buy it. It didn’t work out this time, though, and the reason is that the way this story is told makes no sense to me as a reader, and I cannot fathom why Kay wrote this book from the perspective of a teenager. The story is about a fifteen year-old boy from Canada who accompanies his father, a world-renowned photographer, on a trip to Provence (southern France). 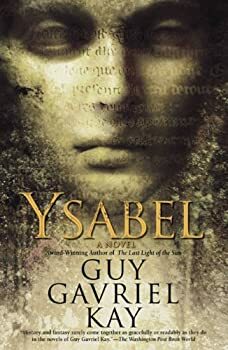 Very quickly into this trip, the characters get caught up in a centuries-old love triangle contest to win the love of Ysabel, which has been waged between a Gaul and a Roman for over 2000 years. The book is short enough that summarizing the plot further will spoil it completely. 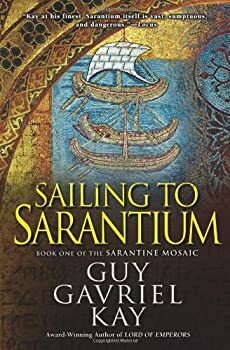 A new Guy Gavriel Kay novel is cause for great celebration and anticipation in our household, as he has authored some of our most beloved novels over the decades (by “our” I mean my wife, my fifteen-year-old son, and myself). A consummate storyteller and stylist (the two don’t always go hand in hand), his long-term consistency is remarkable, and his newest work, Children of Earth and Sky, finds him still at the top of his form.